Born: 1896, St. Peter’s, Norwich, Norfolk. 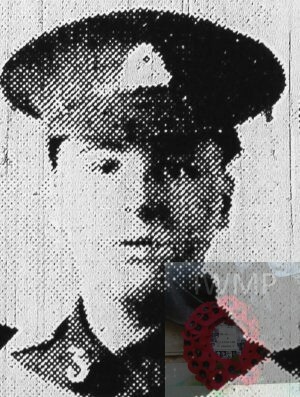 Died: 25th September 1916; age 20; KiA. Rank: Private; Service Number: 9538. Regiment: Gloucestershire Regiment, 2nd/5th Battalion (T). Formerly Private, 2771, Suffolk Regiment. Brother to WALTER JOSHUA CLARKSON & FREDERICK ROBERT CLARKSON. Studd Woodruffe Clarkson, 44, a Pavior Layer, born St. John’s Green, Colchester, Essex. 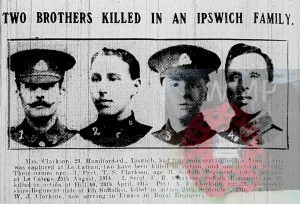 Frederick Robert Clarkson, 8, born St. Peter’s, Norwich. 1911 5, Garrett’s Buildings, St. Matthew’s Street, Ipswich. Arthur was 15 years old, a News Boy – Newsagents. He was living with his parents, siblings sister-in-law & nephew. Studd, 54, a Street Pavior – own account. He was deaf. Walter, 22, a Cattle Drover – Farmer. Blanche, 20, a Sweet Packer – Factory. William Edward Clarkson, 6, born All Saint’s, Ipswich. Hilda Eliza Clarkson, 2, born St. Matthew’s, Ipswich. Harry Paul Clarkson, 1, born All Saint’s, Ipswich. Ellen Barrell, 24, a Box Maker – Cardboard Factory, born St. Helen’s, Ipswich. William Clarkson Barrell, 1, born 8, Castle Street, All Andrew’s, Northampton, Northamptonshire.